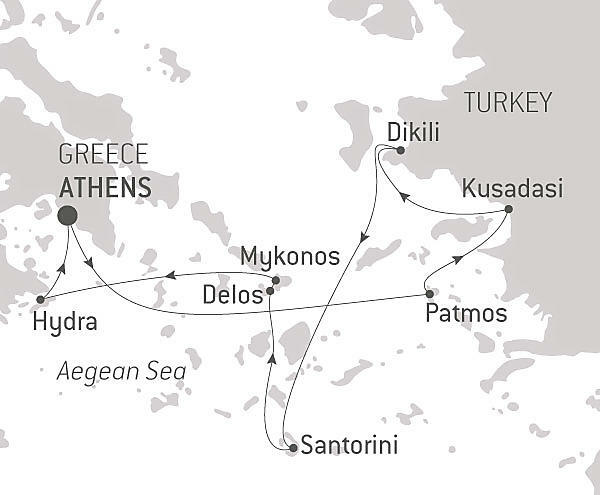 Set sail aboard LeBougainville for a musical cruise in the Aegean Sea, in the cultural cradle of western civilisation. A circuit in partnership with RADIO CLASSIQUE, with the exceptional presence of Alain Duault. This PONANT itinerary will enable you to discover several UNESCO World Heritage treasures over 8 days during unforgettable ports of call, with all this punctuated by recitals performed on board by exceptional pianists. Your voyage begins in Athens, the city of the gods and the great philosophers dominated by the Acropolis, from where you will head for the island of Patmos in the Dodecanese. Saint John wrote his gospels here and it is where tradition locates the Cave of the Apocalypse. Le Bougainville will then sail towards Kusadasi and Dikili, gateways to the fabulous ancient sites of Ephesus and its huge library, a real jewel of white marble, as well as Pergamum and its impressive theatre. The pearls of the Cyclades now await you: the unique Santorini, unfurling the grandiose circle of its caldera, Delos, the sacred island frozen in time, and Mykonos, with its paved small streets and blue-and-white houses. After a final port of call at Hydra, the "Saint-Tropez of Athenians", you will reach Athens, the end of your musical and maritime odyssey.